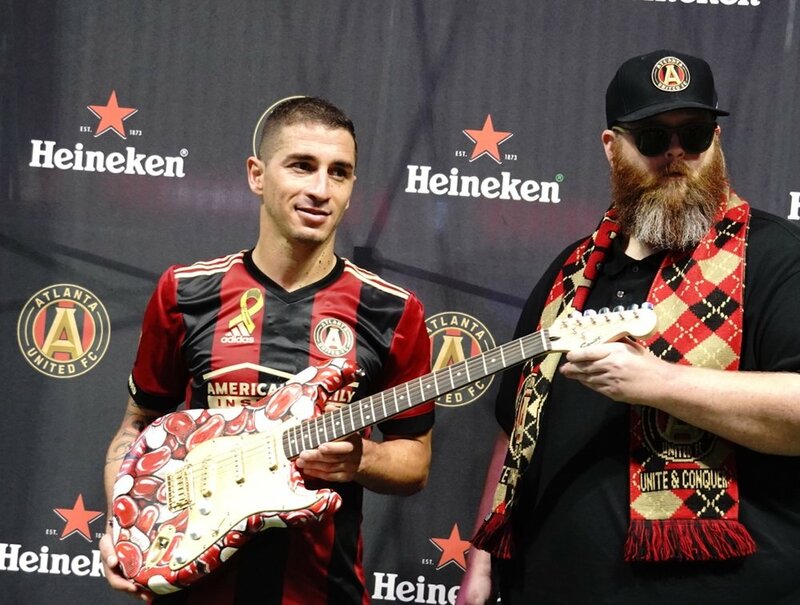 2017- on field with ATLUTD's Carlos Carmona at Mercedes-Benz Stadium, with Custom Painted Guitar for Heineken's Man of The Match. Jeremy Townsend was born in 1977 to a working class family in Jefferson County, Missouri. He began using the pseudonym "Jert" at age 16 (1994). The pseudonym stuck because it sounded weird and was easy for people to remember. At age 20 he discovered the world of live caricature art - and found a means to support himself and travel across the US and Europe without a trust fund. In 2008 he abandoned full time caricature to focus on freelance illustration and independent creative projects. Since then he has shown work vigorously in galleries, group shows and alternative spaces across the US. He is currently focusing his efforts on cultural satire and pop culture iconography. He lives in the Atlanta Metro area with his wife and dogs. 2016, Elephant Room Gallery; Chicago, Ill.